In the early 1990s CSIRO was approached to develop protocols and national guidelines for sustainable effluent-irrigated plantations. The practice of irrigating tree plantations with effluent developed in response to the environmental problems associated with discharging effluent into rivers, often resulting in blue-green algae blooms. Although this practice was enthusiastically adopted, many of these plantations were managed poorly and unsustainably with high risk of causing serious degradation to soil, rivers and groundwater. 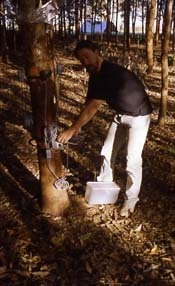 The project was recognised with a number of awards including: the 1999 CSIRO Chairman’s Medal, the 1997 Theo Charles-Jones Tree Award (jointly with Wagga Wagga City Council), the 1996 Australian Banksia Environmental Award for Land Management and the 1995 BHP Landcare Research Award for New South Wales. The ABC television program ‘A Question of Survival’ also featured a 10-minute documentary on the project in 1995. The frequent occurrence of large blooms of toxic blue-green algae in river systems in Australia in recent years is a major environmental hazard. This is partly because of eutrophication caused by the addition of phosphorus and nitrogen from the discharge of treated sewage effluent. Public awareness and regulatory requirements in all states demanding alternate methods of waste treatment saw the establishment of tree plantations irrigated with effluent as a very popular method of land-treatment of effluent as a solution to the environmental problem and as a source of additional forest products for a variety of industries. Despite the enthusiastic adoption of this practice, many plantations were established with little or no information about the hydrological cycle, nutrient cycling and salt management to ensure their sustainability. There were no authoritative guidelines available for Australian conditions to help design, establish or manage sustainable effluent-irrigated plantations and many existing environmental regulations were based on limited knowledge. Recognising these problems, research on land disposal of effluent was a priority of both the Murray Darling Basin Commission (MDBC) and the Australian Water Research Advisory Council (subsequently Land and Water Resources R&D Corporation ‘ LWRRDC) in the early 1990s (see also Murray-Darling Basin Sustainable Yields Project). CSIRO Forestry and Forest Products was approached by the MDBC and NSW Public Works Department (PWD) in 1991 to undertake strategic research with the core objective of developing protocols for sustainable effluent-irrigated plantations and to develop national guidelines. The city of Wagga Wagga was chosen as the research location because of Council’s progressive policy to achieve zero discharge of effluent to rivers by the year 2000 and their willingness to play a key role. The core purpose of the project was to study the dynamics of water, salt, nutrients and growth in plantations of eucalypts and pines, which were irrigated with treated sewage effluent and fresh water. The plantation was established on land under pasture. develop silvicultural options for management. evaluated the suitability of woodchips from effluent-irrigated plantations for pulp (with Laminex Pty Ltd). An independent evaluation of the Wagga Wagga Effluent Plantation Project (Impact Analysis and Evaluation ‘ CSIRO Forestry, Wood and Paper Industries Sector, Sultech Pty Ltd, 1999) estimated that the research has a high probability (85%) of achieving a benefit/cost ratio exceeding 14, with the most likely outcome yielding a benefit/cost ratio of approximately 44. It is important to note that this outcome does not take directly into account the additional important environmental benefit of maintenance of groundwater quality. This value is indeed critically important to Australia. Because of enormous public interest, special attention was given to ongoing communication of results and facilitation of their application by a diverse range of users. Five annual open days and industry workshops were held plus guided group visits for over 4 000 people ‘ including environmental regulators, local government engineers, sewage treatment operators, irrigation and environmental consultants, land care groups, federal and state parliamentarians, visitors from many countries and international agencies (e.g. the World Bank, the International Energy Agency and the NZ Land Treatment Collective), school children and community groups. The project also formed the core of an international conference, ‘Land Application of Wastes in Australia and New Zealand’, held in Canberra in 1996. Myers BJ, 2008, Personal communication.